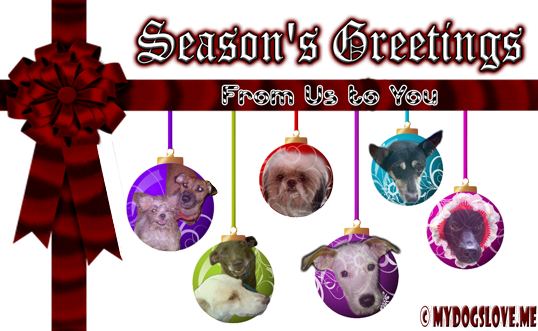 We would like to greet everyone (dogs, cats and peeps alike) a Merry Christmas and a Happy New Year. May you and your family have a great 2013 ahead of you. Once again, thank you for being part of our lives. We hope to spend another year with you in this wonderful community. P.S. We have started our Christmas break early, so see you around after the 27th. A joyous holiday and merry Christmas to you all! Thanks for visiting us today...Have a very happy Christmas! Have a great Christmas! We LOVE your postcard (we did indeed receive it), and are so thankful for your friendship. Those are some perfect ornaments! Merry Christmas! Hope you all have a very Merry and peaceful Christmas! Wishing you a very Merry Christmas and a happy, healthful, prosperous New Year! Wishing you the very bestest of holidays! May you have a Merry Christmas and a Happy New Year! merry festivitals to you all! Please come back on 27th, it's my Gotcha Day! Merry Christmas to all you guys too. Looking forward to a great new year too. We hope you have a very Merry Christmas!!!!! Wishing you and yours a very Merry Christmas filled with much love, happiness, and good cheer! And may the spirit of Christmas bless you and yours throughout the year. We DID get your most wunderful Christmas post card! Thank you so much...Merry Christmas! Hope you had a great Christmas and a fun break. I hope your Christmas was lovely. We had a nice get-together with the family. Back to work tomorrow. Hoping you had a very merry Christmas!! Happy New Year's! Thank you for your friendship and all the fun we have had. Happy New Year, I hope 2013 is a good one for you and your family.